I had the opportunity to visit Daxko through Agile Atlanta and their Agile Tours. I had already heard of the company and their foray into agile through Claire Moss who is, by the way, an excellent world-renowned tester and local Atlantan. That’s why when I heard about the Tour, I knew I had to sign up. The team we were introduced to was fairly typical. It’s a small team with a couple of programmers, a tester, and a UX designer. Additionally they have a design lead and a development lead, who along with the designer formed a Product Owner team. Now it’s not unusual to see a PO team these days, but I did think it interesting to see one on such a small team. I think it’s common for teams to be burdened a bit on “grooming” process; they’d rather be sprinting on current work than thinking about future plans. On the other hand, leaving the entire grooming process up to a single PO can be overwhelming. The product owner team refines ideas until they’re ready to be worked on as stories for a given sprint. This team appears very committed to customer experience. The fact that they have a dedicated UX designer who makes it a point to speak with and visit with customers on a regular basis is a testament to that. The designer showed how she spends time (along with input from the team) making exemplars of their customers through the use of personas. She was very quick to point out that these personas are evolving and can’t, by their very nature, be viewed as explicit representations of what all their customers are like, but it’s a helpful guide for what types of features and the type of presentation they should be shooting for in their products. This analysis along with frequent user-testing of concepts helps create ideas that the product owner team then grooms into actual stories that the team will work on. (Another point driven home by the designer was that she no longer has to create wireframes of interfaces ahead of time. If she wants to prove out a design, she creates it right within a browser. When working on stories, she can pair with developers and build out “real” UI components and shape workflows through system within the sprint! Shocking!) The image to the left shows their epic board (my term). They take these large, and somewhat unproven concepts and groom them, with increasing involvement from the team as they move to the right, until they are ready to be worked on within a sprint. The team uses story mapping to help plan out their stories and schedule. To determine what stories to work on and when, they use Story Mapping. In fact, they brought in Jeff Patton to help show them how to do it. The image on the right shows an example. That top row of orange cards represents the actions their users take, in the general order they are performed. This again is learned from the research done directly with customers. Then, the most essential parts are written on the yellow cards. That first row of yellow cards forms what’s commonly known as a “walking skeleton” or the basic functionality you’d need to provide business value. Then the team continued to add additional functionality further down on the map; the lower the importance, the lower they appear. The blue tape shows how the pieces of functionality should be released as a collection, so this board shows that there are likely to be three planned pushes of functionality. A list of planned releases of functionality color-coded by confidence. Which leads us to the Roadmap depicted to the left. It shows a listing of planned dates and the content that will be delivered on those dates. Note the color-coding. The items in green are dates they are fairly certain they can meet while as things go out further, the confidence decreases. Due to the nature of their business, making firm commitments even 5 months out is a dicey proposition since market needs and priorities can change quickly. Thus, even though the team feels pretty confident they could hit a date that far in the future, it doesn’t make sense to commit to it until they know more information. Seems like a decent implementation of Real Options to me. I got the impression that the rest of the company isn’t completely enamored of this practice. I can imagine that there may be some larger efforts that absolutely need to be delivered by a certain date for business reasons (say, fiscal year end, for instance). In those circumstances it’s not a question of when you deliver, but what. Now that’s a relatively basic agile concept of changing scope but fixing date. If everything is flexible, well, that’s great and I’ll be interested to see if they continue to have success doing things this way. 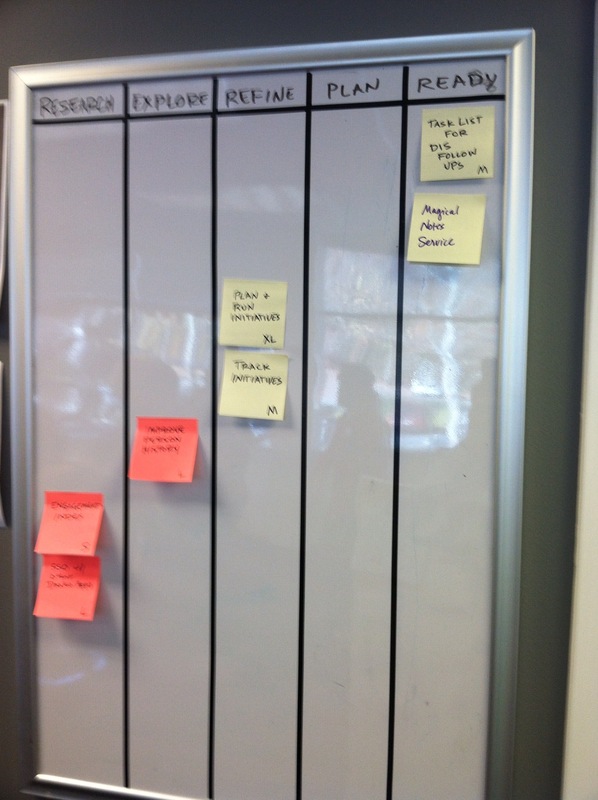 A basic Kanban-style board with some interesting wrinkles. And that’s where we transition from the Product Owner team to the rest of the team, what they term the Product Team. On the right you can see how they track their progress. 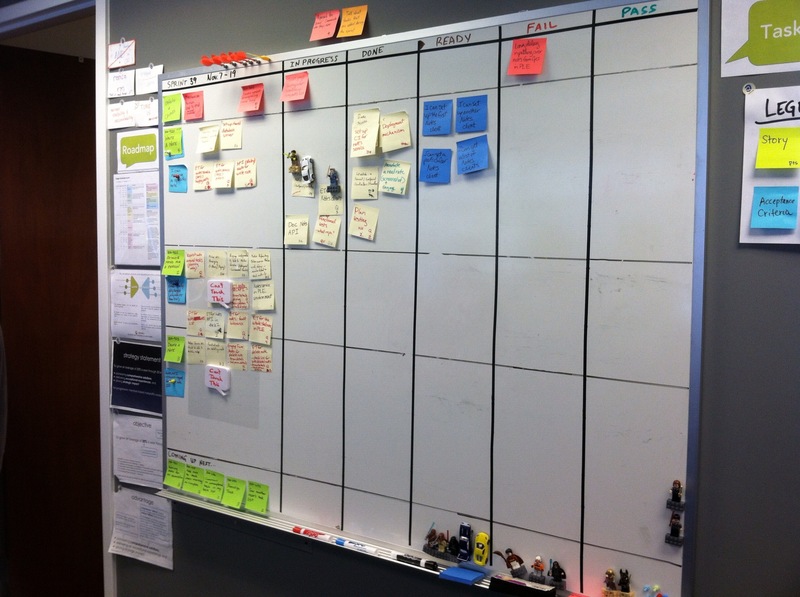 Much of it should be fairly obvious to anyone with experience with Kanban boards. 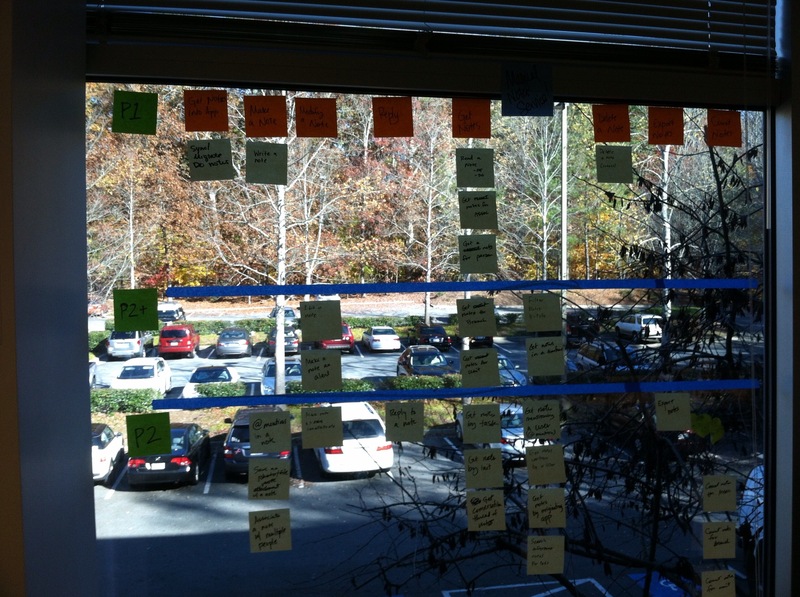 the Green stickies on the left represent the stories, the yellow stickies represent tasks, the red stickies represent defects and the blue stickies represent acceptance tests. The yellow stickies get moved to the right as they go from “In Progress” to “Done.” There are a couple of differences from most boards that I’ve seen that make things interesting. First, note the little magnets connected to some of the tasks. Those represent team members. Each person gets three and you can have no more that on the board at any time. This keeps their WIP limit under control. Genius! Second, do you see those darts on the upper left of the image? They are used to target a note to let people know that this is something someone is stuck on and they need help. Basically it’s an indication that the team should treat this with urgency and collaborate on a response ahead of anything else. Third, note that there is a division a little past halfway on the board. The Acceptance tests are tracked as specific items on the board. Only if those acceptance tests are all in the Pass column can a story be considered done (even if all the tasks are in the Done column). And really, this is the true indication that you’ve completed some work – does it do what we need it to do? There is a growing trend of folks tracking acceptance tests rather than stories/tasks as the true indication of whether work is Done. I like this idea quite a bit. One of the product owners described it as the difference between Output and Outcome. You need to have output from the team, but the reason you do it is to provide the desired outcome, ultimately, that is what you want to track. Finally, look down at the left bottom of the picture. You see a set of stories that are “on deck.” These are groomed and ready to be worked on. If work gets done early in the sprint, or even if priorities change, one or more of these can easily be added to the board. This is another basic agile rule-of-thumb that you should have at least 2 sprints of work groomed and ready at all times. 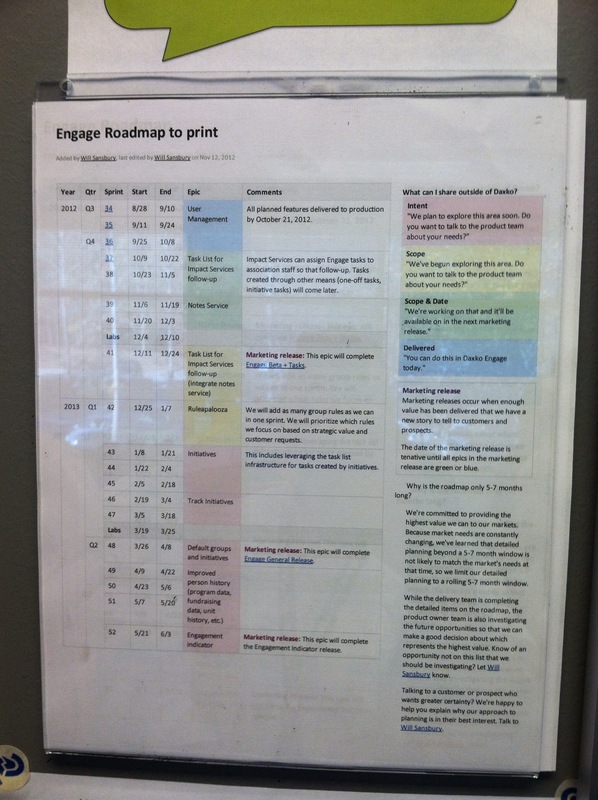 Big visible information is available all throughout the Daxko team room. It’s critical to be absolutely clear on what it means to your team to be “Done” with a story. I like how this team has not only defined this, but made it into a big sign and visible to anyone around. It’s also evident that this is not boilerplate but specific to this team (see the mention of browser types and resolutions) and that it’s evolving. The team was very explicit that they understand that any process or practice they have is only in use as long as it provides value to the team. If they deem it isn’t, they change it or remove it. One example is the burnup chart to the left. They mentioned that this was the first sprint that they were tracking in this way. I pointed out that a flat line for the first four days of the sprint was of dubious value. Perhaps smaller stories would be in order to lower the risk of not delivering anything in a sprint. Additionally, they’re also just starting to track cycle-time. They define it as the time they begin work on a story to the time it’s available for customer use (they’re also tracking the time at which a story is done). I’ll be interested to find out how that information will help them in the future. And speaking of completing stories, in the bottom left of the picture you can see the metal frame of a large bell. They ring that bell whenever a story is complete. There’s always room for a nice Pavlovian reward if it helps the team’s morale! 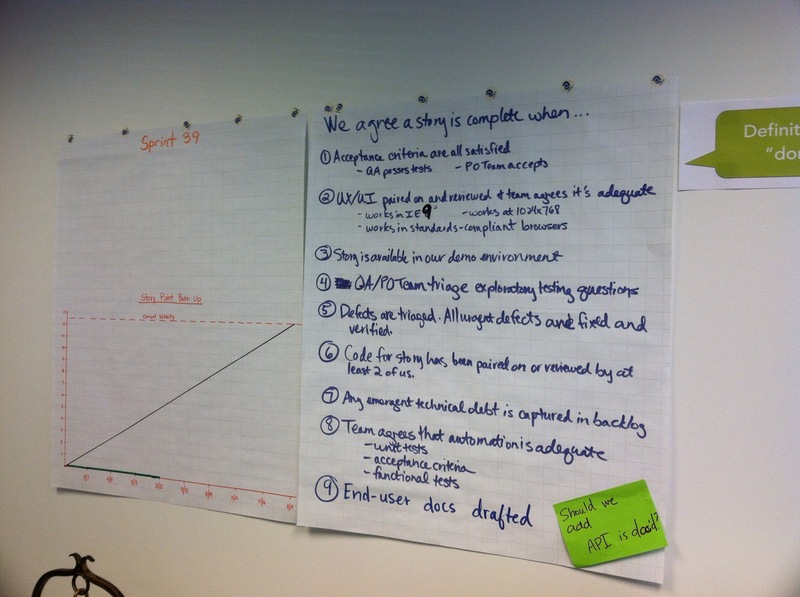 After each sprint, the team has a retrospective. They showed off a whiteboard from the last session that used the metaphor of the team as a ship with wind driving the team forward and anchors weighing the team down. Hey, whatever floats your boat! The ScrumMaster said that he changes up the metaphors and retro techniques to help keep things lively and fresh. The team also does demonstrations of their work to the greater company. Every other Tuesday, this team, and the other teams across the company, have a video conference where each team gets a period of time to show off their work. I’ve noticed that the demo is one of the first things that agile teams drop from the standard Scrum ritual list and I’m glad to see the practice alive and well here. After release, the team also monitors their applications. To do this, they use services from New Relic. It provides the team with a real-time view into what their customers are experiencing. The information presented was impressive and looked very nice. If you can get away with a third party monitoring your application performance, it’s certainly something to look into. While the team certainly seems happy and successful, they are continually looking for ways to improve. They posted a list of some challenge areas right on the wall. One is the challenge of distributed team members. They recently hired a remote programmer and while they do store story information and progress electronically, that individual doesn’t get the benefit of the environment and the physical board and charts the team uses. They’ve been experimenting with a controllable camera, but it appears the jury is still out on that. I suggested they check out the work of Joe Moore from Pivotal Labs who writes a lot about tools and techniques for integrating remote team members. I certainly would like to thank Andrew Fuqua (@andrewmfuqua) and Claire and the rest of the Daxko team for their openness and willingness to share their processes and ideas. I wish that I had been able to stay longer and discuss more things…perhaps next time.